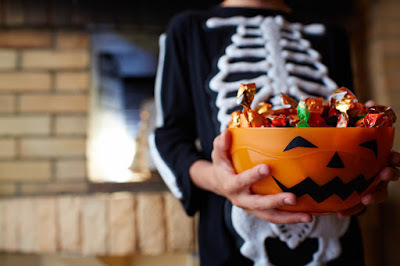 5 Tooth Safety Tips For Halloween - Adelberg Montalvan Pediatric Dental PC & Orthodontics too! Happy Halloween! As pediatric dentists, we’re not necessarily fans of the treats, but we would certainly prefer them over tricks! Unless of course, those tricks would help you and your little one keep their pearly whites in tip-top shape this Halloween! Save the sweets for after dinner. Not only will this keep your children from spoiling their appetite, but it can help keep their teeth safe from decay as well. Saliva production increases after eating a full meal, which means their little mouths will be better equipped to wash away cavity-causing food particles. Stick to sugar-free. Gum sweetened with xylitol, instead of sugar, makes snacking sweet less dangerous for your little one’s teeth. They’ll get all the goodness of sweet, without the cavity-causing additives. Say no to sticky sweets. Gummy, gooey, chewy candy is a no-no! These sweet are more likely to get stuck in your child’s teeth and lead to decay. They can also dislodge filings and wear down bonding or sealants. Incorporate more water. Your kids will surely be running around all evening, scurrying from door to door to collect their treats. Make sure they’re drinking enough water to keep them hydrated, but also to help wash away any residual sugar and food particles snack refuels. Be careful about costumes. Speaking of running around… does your little one’s costume fit right? Make sure there are no loose fabrics that can cause your tiny monster to trip or fall while he’s out running with other ghouls and ghosts. The last thing we need is a broken tooth — talk about a scary Halloween!